At AirZone HVAC Services, we offer a full line of gas fireplace products and services including maintenance. 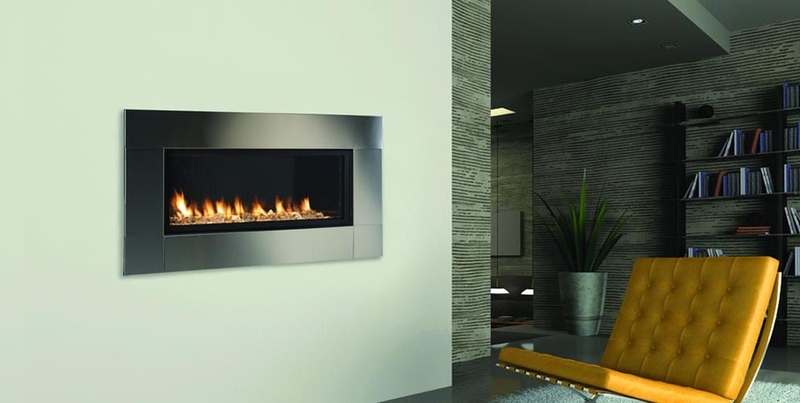 Our major suppliers of fireplaces include products from Majestic and Continential. Majestic has recently acquired Monessen. This merger has increased our product line to ensure we offer our customers high quality fireplaces with a broad selection. We carry interior fireplaces and fireplace inserts along with a line of outdoor products. We also carry stoves which are very popular in the Valley, as well as beautiful gas logs. Interested in seeing some of our fireplaces? We encourage you to click on the Continential, Monessen and Majestic logos to view just some of the fireplace products available to us. Did you know that AirZone sources many different brands of fireplace? We provide high quality fireplace products from more than just Majestic and Continential. Our HVAC connections allow us to source beautiful fireplaces from many different manufacturers. We have made these connection in order to not only service almost every brand of fireplace, but to also offer the exact appearance and look our customers desire. Fireplaces are a very visual purchase. We recommend starting your search on the internet by looking at all of the major fireplace manufacturers. Once you find one you like, provide us with the image and we will give you a price on the exact fireplace or similar looking unit. We utilize this approach to fireplaces to ensure our customers receive the exact fireplace that they are looking to purchase! At AirZone, we offer professional annual maintenance services for your fireplace. Since we are a major Monessen Fireplace dealer, we are trained and experienced in the installation of fireplaces. Our exceptional crew will provide you with honest and reliable recommendations about your fireplace, and perform an annual maintenance. Our annual fireplace maintenance cost is $139 plus HST. Want to save even more? Why not combine your fireplace maintenance with a furnace maintenance? Our gas insert fireplaces can be controlled with the optional signature command system from Majestic. These remote controls offer easy operation of your gas fireplace! This makes it very easy to adjust the temperature of your fireplace, turn it on and off, and enjoy your fireplace. One of the additional benefits of the signature command system is that it offers a battery backup. This means that you can enjoy your fireplace and have warmth if your power goes out. It does not rely solely on AC power and is one of the major differences between Majestic controls and competitors. Other benefits include variable height adjustment of the flame, a memory of your preferred fireplace setting, and a lot more! One of the identifying properties of a fireplace is the log set. This is the actual log product put in the gas fireplace insert. 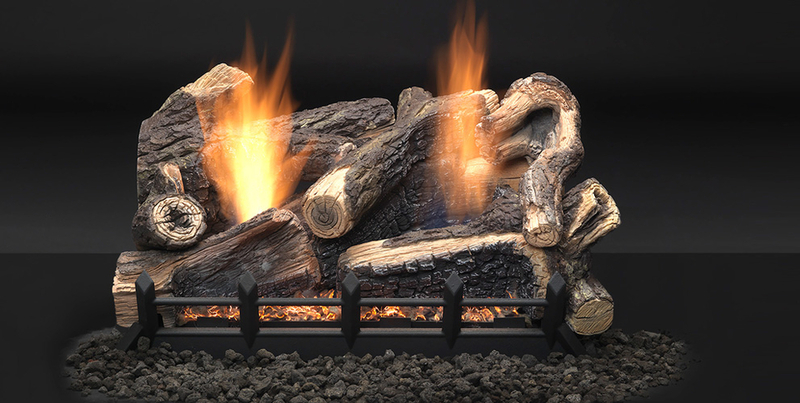 Our log sets are beautifully hand paintend and offer many different styles and options. If you are going for a different look, glass and stone alternatives replace the log in the fireplace. Our stone products are extremely popular for creating a spa like appearance and our glass alternatives offer a more sophisticated modern look. Regardless of your style, we have the log set for you! We had a recent customer who had a discontinued model of gas fireplace with a cracked ignition. The fireplace was no longer operable. We were able to get a custom part fabricated from one of our manufacturers to solve this problem and allow her to get her fireplace up and running again. This is just one example of the gas fireplace repair service that we offer. We work closely with our manufacturers to provide high quality gas fireplace repairs in your home. If you are having issues with your fireplace please turn it off right away. A damaged gas fireplace can be dangerous to operate due to gas leakage and carbon monoxide concerns. Call the experts at AirZone for all of your fireplace repair needs! 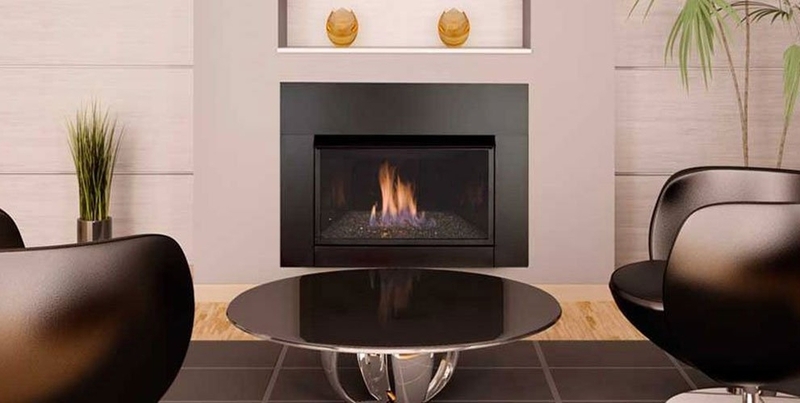 There are two main types of gas fireplaces. Direct vent fireplaces are units that pull the air exclusively from the outside. This is different from a natural vent system that uses the air from within your home to help combust the gas. The major advantage of a direct vent system is that it does not waste any warm air from within your home. By using outside air, you are not using up valuable warm air that has already been heated up by your home heating system (usually a furnace). Some of our fireplace models come with the additional feature of a power vent option. This product uses a blower to pull air from outside increasing the amount of oxygen. It is typically used in a fireplace that has venting that requires the air to travel further distances. With this option, fireplace installations can happen in more locations in your home. The major advantage of a natural venting fireplace is that it tends to be the preferred ambiance over a direct vented system but may not be a practical option in older homes with poor insulation. It can also cause backdraft problems in homes that are too air tight. 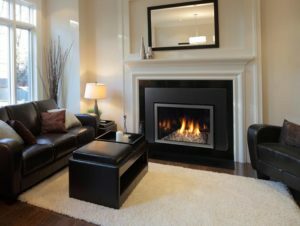 Most Ottawa fireplace consumers are interested in a fireplace product that adds heat to their home. The Maximum steady state efficiency is a percentage that represent usable heat produced by a fireplace. By comparing the BTU (British Thermal Units) with maximum steady state efficiency we can determine the actual BTU output for a fireplace. This is a very important number because it determines the actual amount of heat produced from the fireplace. BTU stands for British Thermal Units. This measurement is commonly used in the HVAC industry. It refers to the heat output provided by a fireplace, furnace or other heating element. Essentially this number represents how powerful the unit is in terms of heating. A higher BTU present in a product means that it is capable of producing more heat than a lower BTU rated product. For fireplaces, this number is an important measurement since it is used to ensure that the fireplace product you are purchasing is capable of meeting your heating requirements for the room where the fireplace will be installed. There are a number of things that you can do to make your gas fireplace safer for everyone to enjoy. First and foremost, we recommend putting up a protective screen in front of the fireplace. The glass at the front can become extremely hot and result in burns if touched. It is also important to be aware of any combustibles that may be around the fireplace. These can light up in an instant resulting in a fire in your home. Another safety measure you can add is protection to the on off switch. Children have been know to play with fireplace switches and may turn them on by accident. It is also important to have your fireplace cleaned regularly. There is a real danger of gas leakage or carbon monoxide exposure if you have not maintained your fireplace correctly. Also make sure to keep pets away from your fireplace as they may be unaware of the danger. Following these simple safety tips will allow you to enjoy your fireplace to it’s fullest. A fireplace is a beautiful addition to an Ottawa home especially in the winter months. There are so many unique designs which can allow you to put a fireplace in the living room, bedroom, bathroom or other area for you to enjoy. What Information Do I Need to Supply AirZone For A Fireplace Purchase? Are you considering putting a gas insert into an existing fireplace that is wood burning? We need the dimensions of the current fireplace along with some pictures of the space. This include the length, width, and height of the opening as well as the lintel depth (how thick the material is at the top of the fireplace opening). We will also need pictures of the exterior of the home where the gas fireplace will vent (such as a chimney). If you are looking at having a gas insert added into a wall where there is no current opening we will need a picture of this area. We will also need an exterior picture(s) to look at different venting options. Which floor will the fireplace be located and installed? Do you have a picture of a fireplace you like? This is very helpful since we source from many different manufacturers and it will help us to get the exact fireplace product you are looking for! Are you adding any finishing material around the fireplace. Common finishes include ceramic tile, natural stone, or a wood mantle. Are you looking to add heat to the room where the fireplace will be installed? If you are looking to use the fireplace for heating purposes, we need to examine the current insulation in your home along with air leakage through doors and windows. We will also need to examine the air tightness in the space. For example, energy efficient products installed in the area (such as windows and doors) can determine the amount of heating required. What material should be used to put in front of a fireplace for safety reasons? Are you looking for a fireplace that is flush with the floor or raised up? Do you know where the gas supply is in your home? Is it close to the fireplace installation area? Is an electrical source present in the fireplace installation area? What type of wall construction is present in your home? Most newer homes use a wood frame approach in the Ottawa area. Is your home single story or two story? Are you considering a roof vent? If so, we will need to examine the roofing material for proper exhaust installation if a chimney is not present. As you can see, there are many factors that go into a fireplace installation. We recommend contacting the experts at AirZone HVAC Services for an in home consultation. This will ensure that we have examined your home and have recommended an appropriate fireplace product that will not only work for your needs, but meet local code requirements and will work at it’s best. We provide free estimates for new gas fireplaces. Our service area includes Ottawa and the Ottawa Valley. We pride ourselves on our no pressure approach and look forward to working with you so that you end up with the fireplace product that you have always desired. Contact us today to receive your free fireplace quote! When you choose AirZone for your fireplace needs, you are choosing a volume dealer that offers exceptional customer service, the latest fireplace products, all backed by our quality you can trust guarantee. Thank you for considering us for your fireplace installation! As a full service Ottawa HVAC Contractor, AirZone offers more than just fireplaces! We are a volume dealer of new furnaces and air conditioners from the top brands. As us about receiving a discount when purchasing multiple equipment such as a fireplace and new furnace. Our HVAC systems are designed to work together to provide the ultimate in home comfort.